3.78m x 1.61m (12' 5" x 5' 3") with glass roof panels bringing good light, coat hooks, shoe shelving, slate flooring, mat well. with two storey green oak framed glass panels opening the view to the rear terrace and garden, oak staircase to first floor, stone walling and slate window sill features, slate flooring. 4.12m x 4.11m (13' 6" x 13' 6") overlooking the rear garden with double door to terrace, large stone fireplace having a granite lintel, slate hearth and fitted woodburner, shelf unit, TV point, beamed ceiling, slate window seat, wall lights. 6.09m x 3.63m (20' 0" x 11' 11") affording a triple aspect over the garden with folding doors to the terrace. A range of hardwood working surfaces and surrounds, slate surround to two inset sink bowls, cupboards and drawers under, matching island unit having an inset Stoves gas hob and extractor hood over. Built in Hotpoint double electric oven, plumbing for dishwasher, space and plumbing for large fridge/freezer. Wood shelving, TV and telephone points, recessed ceiling lighting and wall lights, slate flooring. 2.46m x 2.15m (8' 1" x 7' 1") with working surface, tiled surround, inset 1 ½ bowl sink top, drawers under, wall cupboards, plumbing for washing machine, space for tumble dryer, WC, extractor, Worcester gas fired boiler supplying the central heating and hot water system, Gledhill mains pressure hot water cylinder connected to the solar thermal roof panels. with wide country views, vaulted ceiling, remote operated velux rooflights, linen cupboard, book and ornament shelving beside the staircase, oak balustrade, access to loft storage. 4.43m x 3.59m (14' 6" x 11' 9") with the same country views, vaulted ceiling and exposed truss and beams, two built in folding out wardrobes, attic storage cupboards, TV point, stone walling feature, varnished floorboards. En-suite Shower Room, with a white suite comprising glass door cubicle having a thermostatic hand and rain showers, basin, WC and high level cistern. Copper heated towel rail, extractor, recessed lighting, varnished floorboards. 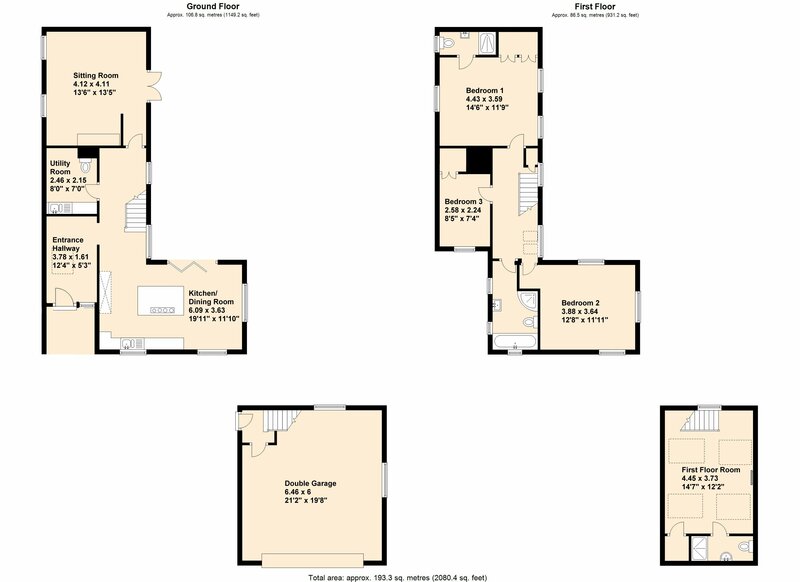 3.88m x 3.64m (12' 9" x 11' 11") with a triple aspect having wide country views, part vaulted ceiling, recessed lighting,TV point. 2.58m x 2.24m (8' 6" x 7' 4") with recessed wardrobe. with a white suite comprising double ended bath, glazed corner cubicle having a thermostatic shower, basin with cupboard under and WC. Illuminated mirrored cabinet, ladder/radiator, extractor, recessed lighting, slate tiled floor. 6.46m x 6m (21' 2" x 19' 8") Well insulated Double Garage, of timber construction under a slate roof with power operated up and over insulated sectional door, power points, lights, windows to the rear and side. At a rear corner is an entrance lobby with electric radiator and recessed door mat having a door into the garage and staircase leading to First Floor. 4.45 x 3.73(14’7” x 12’2”), currently used as a guest bedroom suite with velux windows affording triple aspect far reaching country views, undereaves cupboards, electric radiator, recessed lighting, cupboard containing the mains pressure hot water cylinder with electric immersion heater. En-suite Shower Room, with a white suite comprising glazed and tiled cubicle having thermostatic hand and rain showers, basin on cupboard and WC. Electric ladder/radiator, extractor, recessed lighting. Outside are lights, tap and shower. Gated entrance to large gravelled parking area fenced from the garden with pedestrian gate which heads a path leading down a gentle slope to the main entrance door beside which is a door providing access to the pavement. A lawn lies to the south and west of the cottage fenced from the adjoining field and edged in part with flower beds. From here steps sweep down to the large south facing paved terrace which is sheltered, south facing, sun trap with lights and power points. A walled pathway connects the main entrance with the terrace leading around the Kitchen/Dining Room. The solar thermal panel on the roof heating the water currently provides an RHI payment of approximately £440 per annum. Exciting home of character in south facing village location having a large new addition to a renovated cottage. Energy Rating - D.